The BOND IS PAID on this CHARMING 2 bedroom, 2 bath COLONY Patio Villa in the Village of Woodbury! The home is being offered FURNISHED/TURNKEY and it comes with 2 BICYCLES! (Items w/post-its do not convey.) The 1st thing you'll see is the NEWLY-GLASS-ENCLOSED LANAI (2018) where you can enjoy the year-round Florida sunshine! The Spacious Living/Dining area features VOLUME CEILINGS, an Open-Concept Floor Plan and New (in 2017) LUXURY VINYL PLANK FLOORING! The EAT-IN kitchen is equipped with a NEW (in 2018) STAINLESS REFRIGERATOR & DISHWASHER, Light Cabinets, Lovely GLASS-TILE Backsplash, GAS range, space-saver microwave, a CLOSET PANTRY and PENDANT LIGHTING over the breakfast bar. The Master Bedroom has Volume Ceilings, a WALK-IN Closet, Neutral Berber Carpet, and an EN-SUITE Bath. There are 4 SOLAR TUBES in the home and the HVAC was NEW in 2013! HOT WATER Heater New in 2018. Interior Painted 2018. See list of improvements for MORE! UPGRADED 6-PANEL Interior Doors. GOLF CART Available Separately. This one's a MUST-SEE that WON'T LAST. 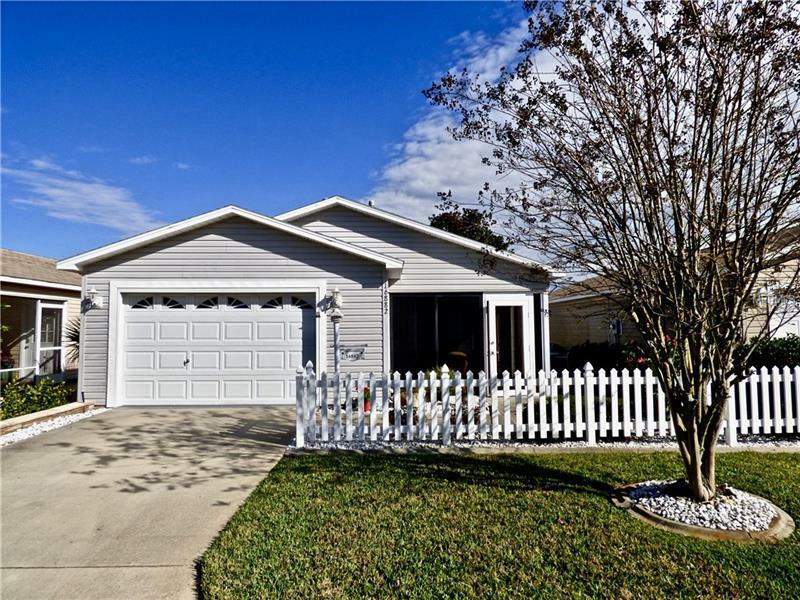 This is a lovely home in a location convenient to numerous golf courses, shopping, dining, pools, tennis, the VA Clinic and all the fun in The Villages!! No BOND. Maintenance Assessment is $329/year. Note: Square footage information is taken from the Public Record and is deemed reliable, but not guaranteed. Room dimensions are approximate: buyer to verify.